A beautifully engraved map of England and Wales. 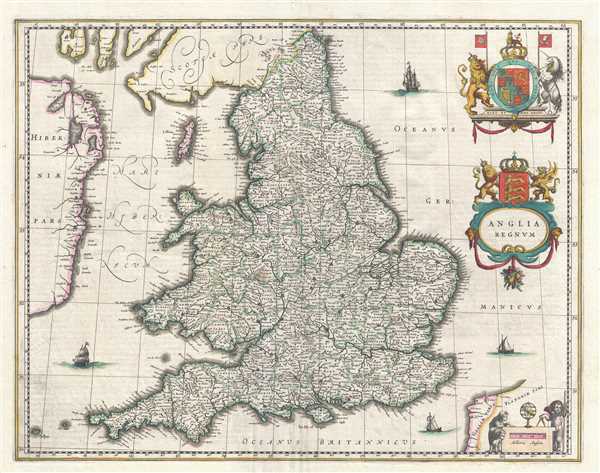 This is a c. 1645 Blaeu map of England and Wales. The map depicts the region from Ireland to the North Sea and from Scotland to the English Channel and Calais. Highly detailed, innumerable cities, towns, and villages are labeled throughout England and Wales, including London, Cardiff, Bristol, and Cambridge. Counties are illustrated and labeled, with a pale green indicating the boundaries between them. Several points along the Irish coast are labeled, along with Dublin and other cities and towns along the coast. Both the Isle of Man and the Isle of Wight are illustrated and labeled as well. Ships are illustrated in the North Sea, the English Channel, and the Irish Sea and the coats of arms of Great Britain and England are situated along the right border, with the coat of arms of England integrated into the title cartouche. A cartouche for the scale is included in the lower right corner and is flanked by two sheep and a cherub. The cherub is performing some sort of calculation, with the help of a compass and an armillary. This map was published by the Blaeu family in an edition of their Atlas Major c. 1645. Very good. Even overall toning. Repair to margin centerfold separation. French text on verso. Rumsey 10017.295 (1665 edition). OCLC 43181652.